The Stansted Skyline Hotel is located just 10 minutes from the main airport terminal and offers a convenient shuttle service. Every room at the Stansted Skyline Hotel has en-suite facilities, Wi-Fi internet access, complementary toiletries, fresh towels, radio alarm clock and tea & coffee making facilities. Ironing board and hairdryer are available on request. At the discretion of the hotel, parking is either taken off-site to a secured compund or it is on-site at the hotel. restaurant is open from 6 pm till 11.30pm and the bar is open until midnight. 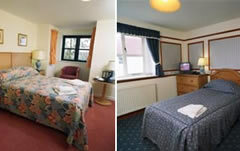 Just one of the many Hotels near Stansted Airport available from FHR. From Junction 8 of M11, follow A120 east, bypassing Stansted Airport and exit Dunmow South B184 then follow the sign B1008. At the first roundabout under the bypass, turn right and at the next roundabout you can only turn left. We are located on the left at the top of the hill. Transfers available from Stansted Airport. Telephone hotel upon arrival for transfer. The pick up area is Bay 36 in Coach and Bus Station. View all Stansted Airport Hotel options available from FHR.